Saint Sampson (Guernésiais: Saint Samsaon; French: Saint Sampson), is one of the parishes of Guernsey, Channel Islands. In 933 the islands, formerly under the control of William I, then Duchy of Brittany were annexed by the Duchy of Normandy. The island of Guernsey and the other Channel Islands represent the last remnants of the medieval Duchy of Normandy. The Guernésiais nickname for people from St Sampson is roînes (frogs). The parish is divided into two non-contiguous sections, the bulk of the parish lying on the east coast, with a smaller section lying on the west coast. The parish of Vale borders the parish to the north and also extends between the two parts of St. Sampson. What is currently the northern boundary of the parish originally ran along the south coast of Le Braye du Valle, a tidal channel that made the northern extremity of Guernsey, Le Clos du Valle, a tidal island. La Braye du Valle was drained and reclaimed in 1806 by the British Government as a defence measure. The eastern end of the former channel became the town and harbour (from 1820) of St. Sampson's, now the second biggest port in Guernsey. The western end of La Braye is now Le Grand Havre. The roadway called The Bridge across the end of the harbour at St. Sampson's recalls the bridge that formerly linked the two parts of Guernsey at high tide. The postal code for street addresses in this parish begins with GY2. The parish church of St. Sampson claims to be the oldest of Guernsey's parish churches, standing on the coast where Samson of Dol arrived from Brittany in the sixth century, intending to convert Islanders to Christianity. The church was consecrated on 22 May 1111 by the Bishop of Coutances. In 1814 there were 125 dwellings, housing 788 residents of Saint Sampson. The parish providing 1/13th of all taxes collected in Guernsey. Harbour facilities improved as trade using the harbour increased. In 1822, 7,000 tons of granite cobbles were exported in 90 ships. By 1836 annual exports had increased to 57,584 tons. In 1841 the south quay was completed and by 1851, 542 ships were using the harbour each year. By 1861 granite exports had risen to 142,866 tons on 737 ships. 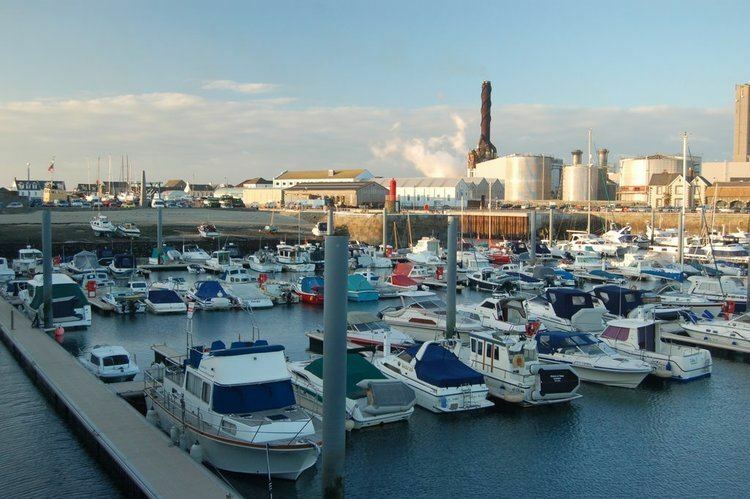 Today the harbour is used for non-containerised freight, including liquid and gas fuel. Shipbuilding took place in Saint Sampson, from local trading craft to a tea clipper called Golden Spur and a steamship, the Commerce built in 1874. The Lydia, a local 173 ton brig, sailed in March 1853 from Saint Sampson to Adelaide with 60 emigrants, it took 132 days. Trams used to run from Saint Sampson to Saint Peter Port from 1879, taking over from a horse-drawn bus that had started operation in 1837. Originally the trams were steam powered, changing to electric in 1891 and continuing in service until 1934. In the Guernsey general election, 2016 there was a 3,509 or 78% turnout to elect six Deputies. Those elected (in order of votes received) being Lyndon Trott, Paul Le Pelley, Jennifer Merrett, Gavin St Pier, Jane Stephens and Carl Meerveld.